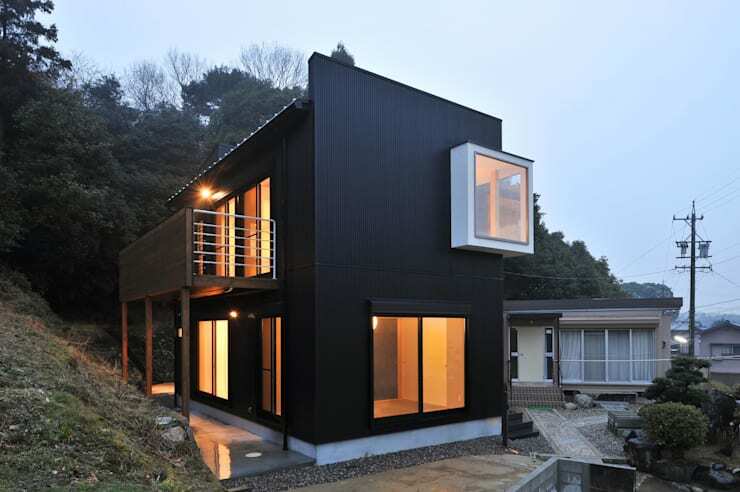 Architecture entails more than designing the layout of a house. A range of factors come into play, like cultural and geographical context, which are crucial in designing a project. 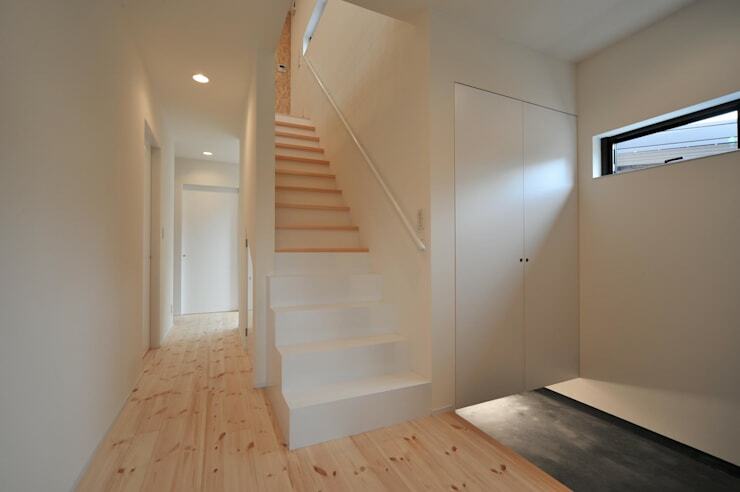 For this reason, a lot of residences situated in Japan boast the typical Asian design style. Although Asian design could be described as a combination of styles, there are distinct recognizable elements which are associated with this type of design: asymmetry, natural materials, strong references to nature, and a simplistic layout, to name just a few. 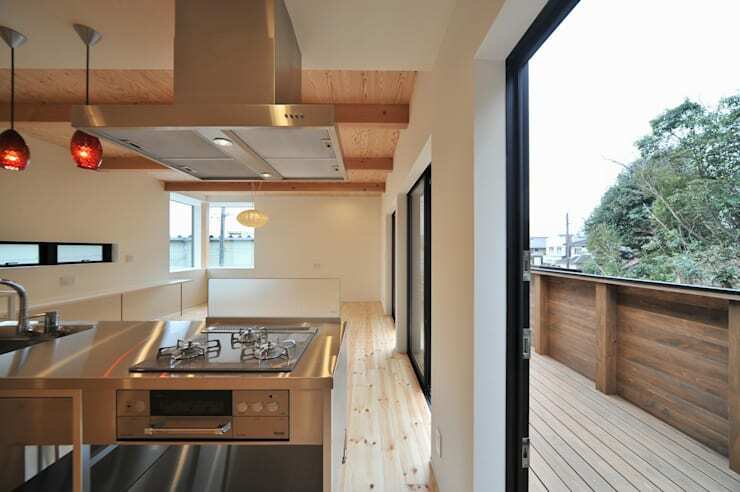 Today on homify 360°, we set foot in Japan for a glimpse at a house that throws all of the abovementioned elements out the window. Wakayama Architects are treating us to an abode that is decidedly “un-Japanese”, yet still packs a prevailing punch in terms of aesthetic quality and visual style. 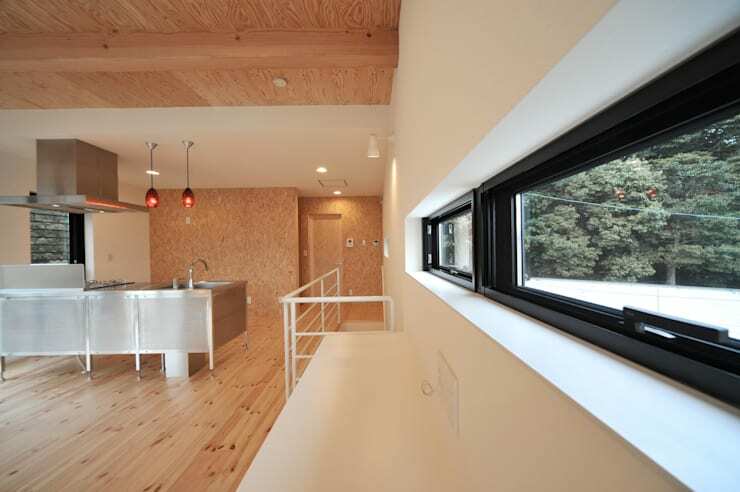 A forested area near the suburban section of Yokkaichi, Mie Prefecture, served as the perfect location for this house. Spreading to the south and west is decadent wooded areas and tranquil natural scenes. Covering a space of no less than 90 square metres, the house strikes a pose that is somewhere between ‘straightforward’ and ‘eye-catching’. Making use of simplistic box-like structures that blend into one another, the house’s colour palette is decidedly less tricky. 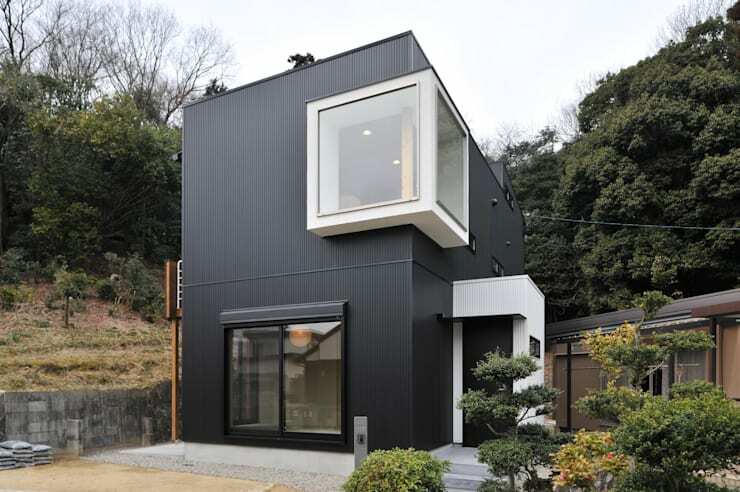 A unique contrast of black and white was chosen for the facade, making for a house that looks like a futuristic, three-dimensional version of a chessboard. As dusk approaches, the ‘chessboard’ comes alive, with interior lighting illuminating the insides like a welcoming ember. That warm interior now makes the outside facade even darker, almost allowing the house’s exterior details to disappear completely. Here on homify, we are big fans of simplicity, which is why we need to draw attention to the fantastic linear design that has been used in the facade. Horizontal and vertical lines disperse from each other, and then meet up again around the corner, making up blocks and cubes to form walls, windows, porches, and doors. Since the exterior spaces made use of dark metal, the interior decided to go a completely different route – and it works perfectly. Pale timber surfaces greet us on the inside, making us reminisce about light sandy beaches and snow-covered surfaces (quite an exceptional contrast). It is this precise wooden tone that softly echoes the traditional Asian design style: blonde wooden planks are a well-known design tool in the East. We just love using raw, natural materials, which is why we want to share with you A Story of Wood and Stone. 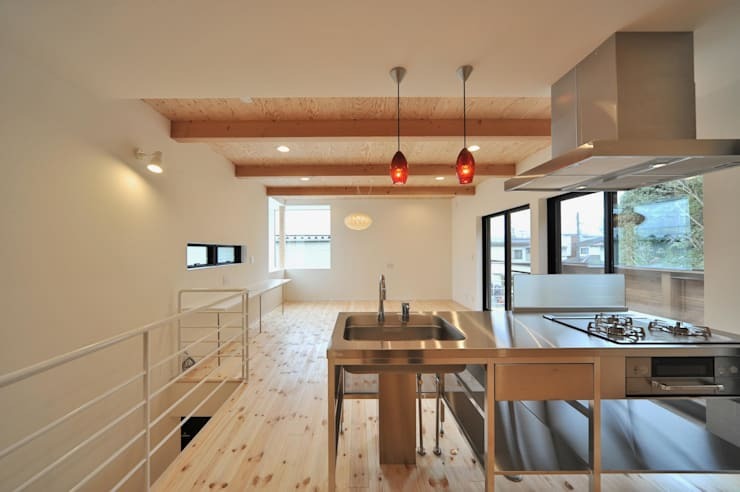 Contrasting most superbly with that light timber is the stainless steel kitchen, located on the top floor. Sleek and slim surfaces frame the culinary space, which is made a tad brighter by the warm glow of the pendant lighting fixtures dangling from above. Hung individually, pendants are perfect for smaller spaces or areas that require direct lighting, such as over a kitchen island. But when hung in a group, pendants can make a big design statement, the same way that a chandelier does. Sharing the open floor plan with the kitchen is the dining area and living room, ensuring a free-flowing vibe throughout all three areas. The success of the wood on the floor has been so fantastic, clearly it was decided to up the timber factor – which is why it was used on the ceiling and select walls. This adds to the warmth and cosiness factors of the interiors, and we cannot help but wonder how wonderfully snug this house must be in the chilly winter. This upstairs area is the social spot of the house, where the family can spend quality time while cooking, dining, laughing, and just bonding overall. As we can see, the clean lined design that was so dominant in the facade continues here, clearly visible in the ceiling beams, floor panels, railing… just about anywhere, really. But what is a spacious and stylish interior without a link to the outside world, especially when that outside is filled with dense forests and fresh landscapes? The upstairs social area is joined by a terrace, allowing everybody some clean and fresh air while taking in the scenery – and waiting for those marvellous family dishes to cook. That stunning wood continues to adorn the surfaces, albeit in a slightly warmer shade for the terrace. Is it just us, or does this house remind you of a weekend cabin in the mountains?